Me: autocorrect! I meant LOL! A sneaky ton of bricks. And there is actually a reason for my posting it, which I’ll get to in a moment. But first, I wanted to express my consternation at being very near the halfway point of the month, and yet, my intention of writing a daily devotional to Loki here, obviously, has not happened. Though it hasn’t been for lack of material – though I did worry/panic a bit at the possibility that I would run out of things to post, and yet, surprisingly, that is not a problem — but it is entirely due to my inability to actually commit to sitting in this chair each day to actually post something. Because now my brain is sorta backed up with stuff, and I have this wild ADHD-fueled desire to Post All The Things(!!). But, with the help of some deep cleansing breaths, I’ve realized that I can commit to, at the very least, posting today about this poem. Well, because, you see, this poem kinda snuck up on me, in a very specifically strange and delightful way, and I figured that finding this poem this morning was a sign that maybe I should talk about this poem. So, I would even say that I somewhat like Whitman’s poetry, and I considered myself familiar with a lot of his poetry, too. But, mind you, Walt Whitman is certainly not enough of a favorite poet of mine that I maintain a digital collection of his poetry or anything. I’d never seen it before. And I almost typed ‘…until today’ but if I said that, it wouldn’t make any sense, really, because I found the poem this morning saved to my ‘Favorite Bookmarks’ list. Now how could that be if I say that I never knew that this poem existed until today BUT it was somehow added to my Favorites list previous to this day? Because it so seems to have been. And yet, I don’t remember ever adding it to my Favorites, and this is my laptop, and no one else uses this laptop but me, and yet, it was obviously added before this day, because there are several entries before and after it that I do remember adding. I don’t know…and yet, here is this poem that speaks to me today about something that has been on my mind for weeks, concerning authenticity. I don’t know what this poem does for you — and feel free to let me know how it strikes you — but I know what this poem did for me this morning. It got me to thinking about Loki’s ‘face’/’facets (and my own, too, of course.). It caused me to think about how each face/facet exists alongside the other faces/facets, and how these faces can be ones that are intentionally shown, or they can be ones that are intentionally hidden, or even faces that one doesn’t realize are being shown/seen or hidden/known until one is ready to see/know them…. Hmmm…there are so many of them, aren’t there? And it’s funny how this poem seems to have shown up on my Bookmarks suddenly, and its words hit me like a ton of bricks. This poem is, in my opinion, a sneaky ton of bricks. But then, again, it strikes me as definitely a poem about approaching. Approaching someone whom one wants to know, or one thinks that they know, and this poem can serve as a little introductory interview. Ah….I see what you did there. How so very… Loki of you. 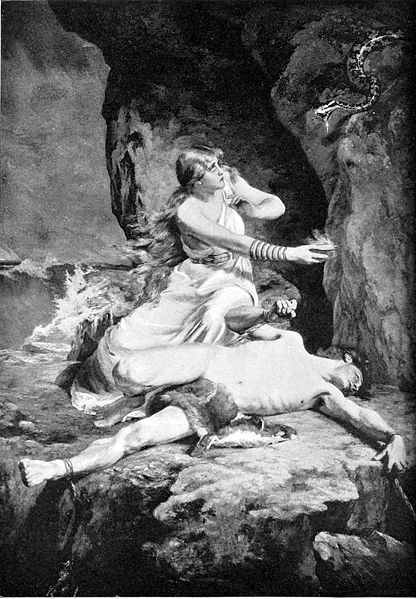 This is the Carl Gebhardt print, Loki and Sigyn, 1896. It hangs over the bed in my bedroom. from the Vatten (see § 4.1.2). Today, I decided that I would work on some embroidery on the altar cloth that I’d been using on my Loki-altar. Previously, I’d had all sorts of ideas for these complex designs that I was going to embroider onto the fabric. But then, I couldn’t find my finer needles. Anywhere. So, with the one needle that I did locate, I decided to stitch something simple…like maybe ‘Loki’ spelled out in runes on one corner. That’s just 4 runes, I thought. How hard can that be? I’d figured that the whole process would take me maybe twenty minutes, a half-hour, tops. Four runes, each about 1/2” in height/width, took nearly an hour to complete. The thread kept tangling. Or downright knotting up. I had trouble trying to make a simple chain-stitch. Several times, I had to double-back on the previous stitches just to get them to show…that is, when I didn’t find that a previous stitch didn’t catch, only to see the last two stitches unravelling or pulling out altogether when I pulled things tight. I’ve never had so much trouble with an embroidery project before. So I was not surprised to have found that quote about a particular Icelandic/Danish folk belief (see above) in Eldar Heide’s Loki, the Vatten, and the Ash Lad while I was reading this afternoon. Yesterday, my offering was to hold the bowl for Sigyn. Usually when I am in the space, holding the bowl, I think about many things, but mostly about what it must be like to be in the cave with Them. The space that I use is somewhat small, and I keep it dark, or mostly so, sometimes with only the light of Their candles on the altar. Sometimes, I visualize things – long shadows in the flickering light, the flash of reptilian eyes and movement above me…sometimes, I can almost see Loki’s face. Almost. Mostly I think about how it must feel: the tight twinge in muscles shifting, the weight of the bonds, the sweat of effort beading down the back of the neck…but most often, Their fathomless grief and loss that mingled with the fatigue of time. But yesterday, I found myself feeling something entirely new. Now usually I eat before doing this ritual, as I often make offerings of a portion of whatever I had for dinner, for Them. Sometimes, I’ll put them on the indoor altar, if there’s room, or I will leave the offering for Them on the outside altar, much earlier in the evening. So, there I was holding the bowl, and oddly enough, within a few minutes, I was suddenly hit with an overwhelming wave of hunger. My stomach knotted and rumbled, and even though I had eaten a full meal less than a half hour before, I felt struck with hunger pangs as if I hadn’t eaten in days. And then it quickly dawned on me. Here was a situation that, strangely enough, had never really occurred to me before: The incredible level of hunger and thirst that They must have felt while in the cave. Perhaps I was feeling a brief portion of Their hunger…? So, I’m almost ashamed to admit that I broke off from the devotion after only ten minutes…but when I did return, moments later, I was certain to bring all the offerings, including the bread, the beer, and the water before I took up the bowl again. Honestly, I am almost ashamed to admit that I didn’t know what ‘fracking’ was! But this is important stuff, especially if you care about the environment and finding alternative energy resources for our future. Thanks!